The WAVENERGY.it S.r.l. is a limited-liability engineering company, which was set up in September 2005. The company is at present an academic Spin-off of the Mediterranea University of Reggio Calabria, with registered office in Via Francesco Baracca, trav. De Salvo , n. 8/a, 89123, Reggio Calabria (Italy). c) plants for the absorption of wave energy (such as submerged breakwater, like the REWEC1 systems, which can be adopted also for the protection of coasts). The company Wavenergy.it LTD was founded by prof. Felice Arena in September 2005 and, as aforesaid, it is an academic Spin-Off: all promoting members were teachers and doctor (PhD) at the Mediterranea University of Reggio Calabria. The request for recognition as a spin-off company was made at the Mediterranea University of Reggio Calabria in June 2009. The Wavenergy.it LTD has been recognized as Spin Off of the Mediterranean University in July 2010. The REWEC3 device was conceived by Professor Paolo Boccotti (full professor on Ocean Engineering at Mediterranea University of Reggio Calabria) and patented by him both in Italy (Patent N.1332519) and in Europe (Patent N.EP1518052B1). Wavenergy.it LTD is the licensee exclusive of the patents (see following pages). 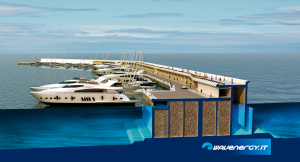 - Partnerships with leading companies in the energy and construction of marine structures. - An update of the ongoing activities of the company is available at www.wavenergy.it. other people are involved in the company projects. A new U-OWC (Oscillating Water Column) device, called REWEC3 (Resonant Wave Energy Converter – Realization 3), which is able to easily obtain a natural resonance with random wind-generated waves, allowing to absorb a large amount of wave energy, has been conceived and patented in Italy. The feature of the REWEC3 device is such to produce an increase of the hydrodynamics performances of the system with respect to traditional OWC plants. All the properties of the REWEC3 will be discussed in the following. 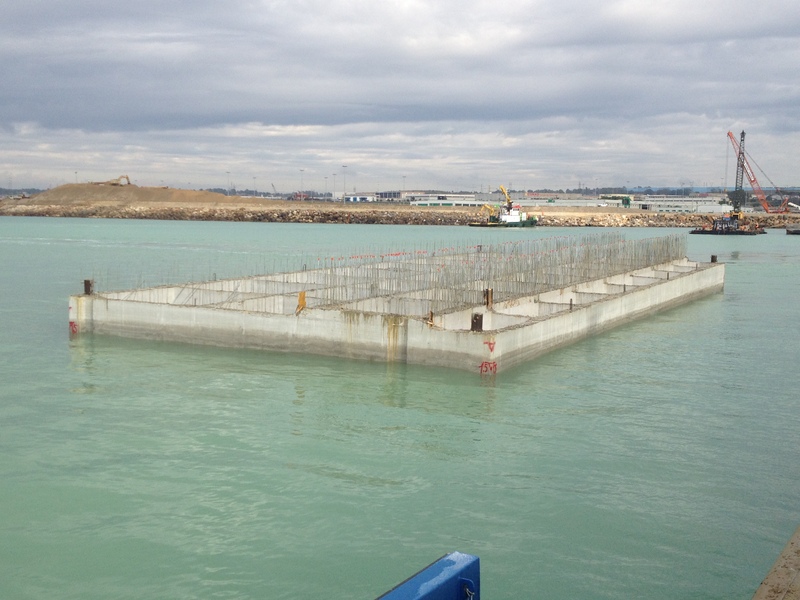 At present, a breakwater prototype of the type of REWEC3 has been building in the Civitavecchia’s harbor (the port of Rome, Italy) in the Tyrrhenian Sea for the enlargement of the pre-existent breakwater (for a total length of 600m). The project has been supported technically by the WAVENERGY.it S.r.l., which is a limited-liability engineering company granted as Spin-Off of the Mediterranea University of Reggio Calabria. An OWC plant could be embodied into an upright breakwater (see Figure 1a). It consists of a chamber (1) with an opening in the wave-beaten side, which is always kept under water surface, so that sea waves can go into the box (1). The upper chamber (2) is connected to the atmosphere by an air-duct (3), where a turbine (4) is lodged. Under wave motion the air in the chamber (1) is alternately compressed (under wave crests) and decompressed (under wave troughs), so that the air produces a flow in the duct (3) in two opposite directions, which drives a self-rectifying turbine connected to a generator for the production of electrical power. The eigenperiod of oscillations inside OWCs is typically smaller than the period of incident waves, and it is not possible suitably modify this eigenperiod. Therefore, some complex devices (Budal & Falnes, 1980; Jefferys and Whittaker, 1986; Sarmento et al., 1990; Falcao & Justino, 1999) were proposed for phase control in each individual wave to reach the resonance condition, necessary for the wave energy absorption. For the OWCs working with random wind-generated waves it was suggested to use feedback control to build a characteristic “imitating” resonance related to the velocity response of the system (Korde, 1991). A new kind of OWC caisson named REWEC3 or U-OWC, has the advantage to obtain an impressive natural resonance without any device for phase control. Figure 1b shows an example of REWEC3 plant embodied into an upright breakwater (Boccotti 2003, 2004, 2012; Boccotti et al., 2007). Firstly, it is worth-mentioning that this modified caisson, which is able to absorb wave energy (and to converting it into electrical power), is structurally very close to traditional caisson breakwaters. The plant is defined, on the wave-beaten side, by a vertical duct (2), which is connected both to the sea through an outer opening (1) and to an inner room (4-5) through a lower opening (3). This inner room contains water mass (4) in its lower part and an air pocket (5) in its upper part. An air-duct (6), which connects the air pocket (5) to the atmosphere, contains a self-rectifying turbine (7). When waves produce pressure fluctuations at the outer opening (1), water oscillates up and down into the duct (2) and, thus, into the inner room (4). Consequently, the air pocket (5), inside the inner room, is alternately compressed and expanded and an alternate air flow is obtained in the air duct which drives the self-rectifying turbine (3) (see Figure 2). Schematic cross-section and plan: (a) of an OWC plant embodied into an upright caisson breakwater; (b) of a REWEC3 (or U- OWC) plant embodied into an upright caisson breakwater. A comparison between Figures 1a and 1b shows as, with respect to a traditional OWC, in a U-OWC plant, the additional vertical duct connected to the inner room [elements (1,2,3,4,5) in Figure 1b] defines a U duct in the sea-beaten side of the modified caisson breakwater. Even if the U duct does not determine important structural modifications in the U-OWC with respect to the classical OWC, it is able to produce important differences on the hydrodynamics inside the U-OWC plant, which are responsible of its performances and of its energy efficiency. In fact, in the U-OWC (REWEC3), with respect to the OWC, waves do not get into the structure, but they act as strength to establish the motion of compression and decompression of the air pocket inside the plant. i) The U-OWCs are able to absorb an amount of wave energy greater than that one absorbed by the conventional OWC in every feature, in the heavy sea states and in the lowest ones (Boccotti, 2007b) and under wind waves and swells. This is, mainly, due the following reason: a U-OWC has an eigenperiod greater than that one of a conventional OWC, and close to the period of waves with the large percentage of wave energy (note that the eigenperiod of OWCs is small with respect to the periods of ocean waves). Two small-scale field experiments on two different kind of REWEC plants were carried out in the Natural Ocean Engineering Laboratory, NOEL, of Reggio Calabria off the eastern coast of the Straits of Messina (Boccotti, 2003; Boccotti et al 2007; Arena et al., 2003, 2007). The results validated the theoretical model for the plant hydrodynamic. ii) Most of all, the additional element in the new U-OWC caisson enables us to regulate the eigenperiod of the plant during the design. Therefore the plant can be designed to have an eigenperiod very close to the peak period of the incident wave pressures to which the greater amount of wave energy is associated. The eigenperiod of the plant is regulated by designing suitably their active parts [elements (1,2,3,4,5) in Figure 1b]. That allows for achieving strong amplifications of the performances of the REWEC3 plant with respect to classical OWC. iii) The structural resistance of a conventional OWC is reduced because of the large opening at the sea-beaten side. The U-OWC exceeds this limit, being characterized by a high structural resistance guaranteed by the two vertical walls (that one of the vertical duct and that one of the inner room) partially superimposed on each other on the seaward side. Some examples of production of electrical power from REWEC3 devices are shown in Table 1 (values taken from Boccotti, 2004), both for locations in the Central Mediterranean Sea as well as off the West coast of USA (California).